In the “dark ages” of Europe, people began reading silently to themselves, and a love of books and learning took hold, pioneered by Bede. Below is a chapter excerpted from The Edge of the World, by Michael Pye, as recommended by Longreads contributing editor Dana Snitzky. There was nobody else alive, nobody who could read or preach or sing the service, except the abbot, Ceolfrith, and one bright boy: who was local, well-connected and about sixteen, and whose name was unusual. He was called Bede, and he wasn’t called ‘saint’ or ‘venerable’, not yet. In 686, the sun went dark behind the moon. When the eclipse ended the plague came suddenly from the sea. It broke into the monasteries like this double house at Jarrow and Wearmouth in Northumbria and all the little ports along the coast. It killed quickly. The old abbot, Eosterwine, was sick and dying and he called all the monks to him. ‘With the compassion that was second nature to him, he gave them each the kiss of peace,’ Bede remembered. Nobody worried then about touching the sick; sickness was known to come in an impersonal miasma, a kind of mist; so the abbot’s kindness killed almost all of them. The deaths left a quiet in the stone church that was as bad as the sight of walls stripped of pictures or a library without books: the house was reminded that it had lost its glory. Music was not yet written down; it lived only in men’s minds and could be learned only by ear; if it was not sung, it was lost. The monks had been taught ‘at first hand’ by the chief cantor of St Peter’s in Rome, and plainsong was one of great riches of the house; they were the first to sing Gregorian chant in Britain. But now the familiar antiphons, the sacred conversation of voices answering each other back and forth across the choir, were gone. Ceolfrith was miserable, even tearful, and he stood the quiet for only a week. He needed to begin the familiar services again. He began by singing on his own, and then the boy Bede joined in: two voices instead of a dozen taking the parts. It was a thin sound in the small stone chancel, but they did what had to be done: they kept the music alive. The plague went away almost as suddenly as it had come, and Bede lived to see the monastery thriving again. A whole new generation of novices arrived. There were new political crises, especially a tyrant king called Osred, which made the monasteries into a most welcome refuge. When Ceolfrith decided to go to Rome in 716 he left ‘behind him in his monasteries brethren to the number of around six hundred’. And this was all the world that Bede ever knew. He’d been taken to the monastery at the age of seven, and dedicated to the Church by parents who may have been quite grand and certainly lived close by. He hardly ever left, except for study in another monastery; he never went on pilgrimage; he never travelled the fixed route from his home in the northeast of England to Ireland, which other men used in order to study or to escape the world or go out missioning. He could have gone overland from one church guest house to another, taking the usual three days and nights in each; he could have met up with the professional sailors who worked in the monastery on the island of Iona off the west coast of Scotland; he could have followed the tracks of his colleagues and predecessors to the Firth of Forth and then to the Firth of Clyde and then across to Derry. Those were regular routes even after the strong connection between the Christian communities at Lindisfarne and Iona was broken. Instead, Bede lived almost always inside his new, closed family. He shared all its high emotions. Before Ceolfrith there had been two abbots for the two monasteries, one at Jarrow and one at Wearmouth: Benedict Biscop and Sigfrith. The two men were deathly sick at the same time and Bede remembered how Sigfrith had to be carried on a pallet to see his friend, and set down to lie side by side on the same pillow. Their two faces were close, but the men did not even have the strength to kiss; the monks had to reach down to turn their heads towards each other. Bede found it, he wrote, ‘a sight to move you to tears’. When Benedict decided that the two houses should be run by one man, and that man should be Ceolfrith, Bede tells how their virtues bound the two men together ‘more closely than any family relationship’. This Ceolfrith was central to Bede’s life, the father who never sent him away, and when Ceolfrith decided he would go again to Rome, this time to die, Bede had the one moment of crisis he acknowledges in all his life. In the preface to one of his biblical commentaries he writes of the consternation he felt, the ‘sudden anguish of mind’. Being shut in by the monastery walls, the only way Bede could know the world outside was to read, study and ask; he had to build his whole world with books. The library Bede knew, some two hundred manuscripts, had been assembled by men who thought books for reading were just as important as pictures or relics or music. Benedict Biscop, the founder of the house, brought back ‘a large number of books on all branches of sacred knowledge’ from his third trip to Rome, ‘some bought at a favourable price, others the gifts of wellwishers’. 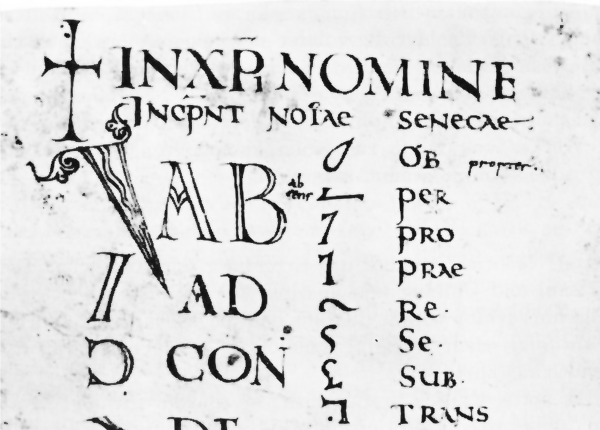 The book trade was flourishing and it was complicated: Bede could read at Jarrow a codex of the Acts of the Apostles, Greek and Latin versions, which had been in Sardinia until the seventh century and ended up later in Germany. On Biscop’s next trip, he brought back ‘spiritual treasures of all kinds’ but ‘in the first place he returned with a great mass of books of every sort’. Everything else—relics of the saints, holy pictures, music in the Roman manner and even a promise of perpetual independence from any outside interference—comes further down the list in Bede’s account. His friend and mentor Ceolfrith, the third abbot, ‘doubled the number of books in the libraries of both monasteries’, he says, ‘with an ardour equal to that which Benedict had shown in founding them’. These books were Bede’s work. From the time he became a priest at the age of thirty ‘until the age of 59’ he says he spent his time studying Scripture, collecting and annotating the works of the Church fathers and making extracts from them, adding his own explanations, even putting right one rotten translation from the Greek. He was under orders from his bishop to gather and make a digest of the books around him because they were so many and so long that only the very rich could own them and so deep that only the very learnèd could understand them. He was to take the riches of the Jarrow and Wearmouth library, manuscripts of all ages and origins, and publish them to all those houses which did not have a decent library at all. Books were not fine possessions to be stored away, precious but not for use; they were a practical way to distribute ideas and information, ship them out and share them. Bede knew the whole process of making books from imagining and dictating the words to being the clerk who took them down, in the medieval version of the Roman shorthand called ‘Tironian notes’, a puzzle of dots, bows and teardrops, curved, wavy and straight lines all tilted five different ways and taking their meaning from where they were placed on the page. The code was an important part of literacy; it was schoolroom stuff. He also knew about being the scribe, the one who made fair or even lovely copies of the final result; he worked on one glorious coloured and decorated Bible, the Codex Amiatinus, which was given to the Pope. Tironian note glossary from the 8th century, Codex Casselanus. Via Wikimedia Commons. So he worked in the scriptorium, the writing place, a narrow world inside the monastery. Everyone wrote exactly the same way: a neat, uniform and impersonal hand. In Jarrow, the writing was an uncial script, which is round like your first schooldays writing, but all in capital letters. Getting it right was very important because uncial script was Roman, and Jarrow was very much a monastery which looked to Rome. The Irish monks on Iona used an island script, and they had full heads of hair; at Jarrow the monks had the tonsure and they wrote in the Roman way because to do anything else would have bordered on heresy. Rome and the Celtic Church in the North were still arguing over issues such as how to date Easter, and writing was a way to choose sides. The scribes could sometimes play and make something personal in the decoration of the page, even glory in the beauty of what they could make, but it would be centuries before scribes could have reputations as artists. The act of writing was anonymous and a matter of monastic discipline. They wrote with black ink made of oak galls and iron salts, using goose feather quills. They wrote on parchment: sheepskin or the hide of a calf, shaved, polished and cut until it had the texture of a kind of suede and a colour close to ivory, between white and yellow. When they wanted colours, gold was gold leaf, silver was silver leaf, fixed to the page. Black in the painted patterns and images was usually carbon, white was chalk or crushed shells; blue was woad before the much more costly lapis lazuli was easily available, purple came from lichen, yellow from a salt of arsenic, oranges and reds from toasted lead, and for green the scribes used verdigris, made by holding copper over vinegar for a while. 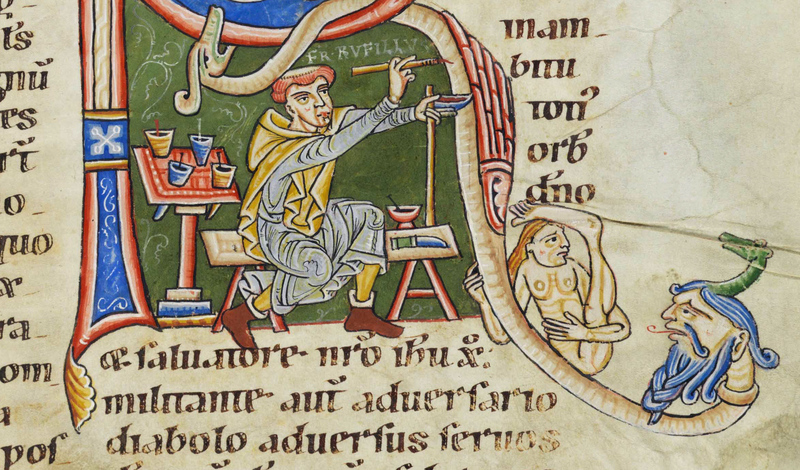 A scribe making a book as lovely as the bible made at Jarrow for the Pope, or the Gospels made at Lindisfarne, was chemist and artist all at the same time, especially in the making of subtler colours like the surprising, polished pinks. Then after the evening service of Compline there was time for cutting, polishing and ruling the skins for parchment. The ruling, done with the sharp point of a stylus or an awl, was vital if the text was to line up; pages were written separately and they had to face each other squarely in the finished book. There was also the business of discreetly correcting the pages already written. Correcting meant adjusting the letters and making sure they were the proper ones, but also putting in punctuation, which was often done after the words and letters had been written out. Punctuation was points, and the longer the pause the more there were and the higher they appeared above each line. Everything about Bede’s life makes it seem that he was regulated and confined—everything except the books he wrote. His monastery was not strictly Benedictine but he closely obeyed the Benedictine rule of stability: to stay put. He chose never to be a pilgrim like the abbots of his house, even though he knew very well that the Irish thought you could hardly be Christian without travel to Rome, to shrines, to other places of learning. Most of his writing is careful, thoughtful accounts of the Bible, book by book, the kind of work that is best done in a closed, quiet room; and he was also, as he says, very familiar with the brisk, meticulous business of being in a scriptorium. So what liberated his mind to puzzle over where he was in time, and how the moon affected the sea and what might explain the plague even better than God’s anger? For a start, monasteries were not at all cut off from the general world. Plague proved that. In the months after the sickness ‘of great villages and estates once crowded with inhabitants only a tiny scattered remnant remained, and sometimes not even that,’ Bede wrote. The monasteries shared their fate because they were often on the coast, which was where plague landed; plague travelled fastest by sea. They were also connected to all those great villages and estates, for monasteries were markets, hubs for trade in commodities like salt; people were always arriving and leaving. Villagers came in to worship, and monks went out to minister to the villages. Even on the more remote monastery island of Lindisfarne, sickness persisted for a year and almost every man died; even Lindisfarne was in the world. The most surprising scraps of knowledge filtered into the scriptorium. In the bible that Jarrow made for the Pope there are curious marks on the golden halo round the head of Ezra the Scribe: they may just be tefillin, the tiny leather boxes holding fragments of the Torah that some Jews wear. Ezra also wears the headdress and breastplate of a proper Jewish high priest. It is true that Christians later had to be stopped from wearing St John’s Gospel as a cure for headache, which is a mutation of the same idea, but someone knew actual Jewish customs. The elegant designs on the page that look like the most subtle carpets owe much to Coptic art, and to the kind of prayer mats that were used in the Middle East and only later in Northumbria. When the monks came to bind up St Cuthbert’s own bible, buried with him as a kind of Book of Life, they sewed the binding in a distinctly Coptic style. These elaborate decorations meant experiments with new techniques and new tools. Eadfrith of Lindisfarne, in the very early eighth century, started to use lead to draw out his designs on the back of the page; then he set the sketches on a frame of transparent horn or glass and put a strong light behind them so he could consult his design as he painted the page itself. He worked alone so his inventions went no further at the time, they were as hidden as he was, but they were remarkable: he made the first lightbox and the first lead pencil. Bede did much more than make scrapbooks out of the texts he knew. He checked and changed, left things out and added to the old ideas; he thought again. He chose which old books to believe when he wrote history and he reshaped history by fitting the particular history of England into the grand and biblical story of the whole world. He was trying something extraordinary: to see where he stood in time. He puzzled over things that others took for granted, like the plague and how it could be God’s will when these were the happiest times for the English and their Church, the age when they had Christian kings to rule them and priests to teach them and the whole of England was learning to sing holy songs. If disease was God’s judgement on sinners, ‘the avenger of evil deeds’ as it was supposed to be in pagan times, then why was He punishing His people now for doing the right thing? When he came to write his schoolbook about nature, De rerum natura, Bede looked beyond the Bible and the usual written authorities; he used experience. He connected plague with the thunderstorms that break up summer and start the autumn, to the corruption of the air due to excessive dryness or heat or rain. He had no grand theory, but he looked and asked questions. He was right about the season for plague, although he never knew the reason. The sickness was spread by fleas that lived on the bodies of rats, which fed on the corn transported by ships, which sailed in the summer. He saw the moon riding higher in the sky than the sun and asked how that was possible when everyone knew the moon was closer to the Earth. His explanation was an elegant experiment in thought: he asked his readers to imagine they were walking at night into an immense church, all brightly lit for some saint’s day and with two particularly brilliant lamps: one hanging high at the far end, one hanging lower but closer. As you walked into the church the lamp that’s closer would seem to be hanging higher than the lamp in the distance and as you walked forward it would seem to move higher and higher still until you were directly under it and the truth was obvious: it seemed higher precisely because it was closer. He casually suggested that it would be easier to work out the age of the moon if you knew your fifty-nine-times table, which suggests that he did; he used mathematics even though it was hard to manage any complicated sum using the inflexible Roman numerals. His near contemporary Aldhelm used to complain that remembering the numbers to carry over when adding or dividing or multiplying or subtracting was so difficult that he could manage only when ‘sustained by heavenly grace’. Bede’s method was to do sums on his hands, not on paper, with a system of straight and bent fingers in different combinations that could reach 9,999; after that, he says without explaining, you need other parts of the body. The system had other attractions for a boy in the quiet monastery, a scribe in the silence of the scriptorium. Just agree a simple code, settle on a number for each of the twenty-three letters of the Roman alphabet, and the system allowed silent talk across a room. Bede fixed the story of how the Anglo-Saxons came to Britain and how they brought true Christianity; he wrote commentaries on Scripture that were in demand across Europe; but more than those, he was the hero of computus. It may have been his most remarkable achievement at the time, but even the word is unfamiliar now, let alone the thinking: a blend of maths, astronomy and ideas about how the universe is shaped, all combined to establish a true and proper calendar. Anything to do with number had an element of holy mystery since as one Irish text has it ‘take number away and everything lapses into ruin’. The calendar also had everything to do with medicine, since diagnosis and treatment were linked to astronomical time, but computus had one main use: to calculate the date of Easter. The whole Christian year was shaped by the date of Easter; but the Church’s own rules for fixing it meant Easter fell on a different Sunday each year, a floating feast. It was not just the most important festival, the day for remembering the event that gave Christianity meaning; it was also one of only two feast days on which anyone could be baptized into the Church, unless they were in imminent danger of dying unsaved. The other was Whitsun, and that always fell seven Sundays later. Without a settled date for Easter, nobody would know when to begin the long forty-day fast of Lent, which ends on Easter Day. So the date had to be set well in advance; it was not like the Islamic Ramadan which can be fixed by observation, watching for a full moon and the equinox. Fixing Easter required a kind of calculus. It involved bringing two different calendars into line: the thirteen months of the Jewish calendar and the twelve months of the Roman calendar. The Gospels say Christ died during the Jewish feast of Passover, and Passover is fixed on the first full moon of ‘the first month’ in the Jewish lunar calendar. That would seem clear enough, except that the early Church fathers decided that it really meant the first full moon after the spring equinox, and that is where the trouble started. The date of the equinox was fixed according to the very different Roman calendar, which follows the sun. And since the solar year isn’t a round number of days, the actual equinox tends to come adrift from its official date, which complicates things even more. This was a political issue. The Church was one Church, united, so it could not celebrate Easter on different days in different places. The Church was ruled from Rome, whatever the Irish Church thought, so the date had to be the one set in Rome. But the Irish insisted that news did not always travel reliably from Rome, so they devised their own way of fixing the date, and those ways did not agree with Roman ways. Bede was a true Roman, and he set out to find a universal answer to the problem. He had to be radical. He was not being a historian now; he was looking to future dates and saying what would happen. He had to find names for years that were still in the future, something which neither Germans nor Romans did; they both named years after the king, emperor or consul in power at the time, so that Bede’s own monastery was begun in the twenty-ninth year of the reign of King Ecgfrith rather than what we know as 674 ce. He used thought and facts to solve an immediate problem, which was something the ancients hardly ever did in writing; their science was the recording of facts for their own sake. He needed a practical result from numbers, with (and despite) all their holy and mystical significance. He then had to deal with the Irish, and find a formula that Rome could happily endorse. He showed how the moon years and sun years came together in cycles of nineteen Roman years. Writers before him had worked out the cycle, but he was the writer who gave them authority and spread the idea; he published it. For that, he had to understand the movements of sun and moon. He began with the written authorities in the library, who had ideas on how the moon works in the world: the bishops who said oysters grow fatter as the moon grows fuller, that wood cut after the full moon will never rot, that the more moonlight there is, the more dew. Then Bede observed for himself the phases of the moon and their real effect in the world. He took what the Irish already understood, the connection between the stages of the moon and the force and height of the tides, and he brought that to everyone’s attention. He also refined it. He understood that the moon rising later each day was linked to the tide rising later each day, a pattern he could never have recognized without knowing that the Earth was round. From this he built a theory: the tides were not water gushing out of some northern abyss, nor water somehow created by the moon, but the moon tugging at the sea (‘as if the ocean were dragged forward against its will’). He measured the tides against the phases of the moon, and he measured them exactly, to the minute. For his history he had correspondents in many other monasteries along the coast from Iona in the west to the Isle of Wight in the south, and he may have asked the monks in each place to make observations for him, too. However he did it, he certainly knew that the time of the tides could be different in different places (‘we who live at various places along the coastline of the British Sea know that when the tide begins to run at one place, it will start to ebb at another’). He found that both moonrise and high tide were a little later each day, later by exactly 47½ minutes. For centuries his work was mined for astronomical information. When it was finally printed and published eight centuries later – in Basle in 1529 and then in Cologne in 1537 – it was not out of antiquarian interest. It still had immediate, practical value, despite the need for notes to explain all the difficult bits. Indeed, his work has often survived better than his reasons for doing it. We still date events from the ‘year of Our Lord’, Annus Domini, the year of Christ’s birth; that was Bede’s invention – part of his solution to the problem of the calendar. Christianity was only just growing out of its eschatological phase, when the world was expected to end any day, and Bede wanted to rewrite world history and its ages to prove that the world still had a long time to live. He wanted to place himself in time, past and future, and in doing so he built the Western calendar as we know it. Christianity was only just growing out of its eschatological phase, when the world was expected to end any day, and Bede wanted… to place himself in time, past and future, and in doing so he built the Western calendar as we know it. He found himself arguing on occasions with the living and the dead, which could be dangerous in a Church that valued authority so much, and Bede had reason to know that. He once heard that he had been accused of heresy by someone who was having dinner with a bishop. He was aghast, he told his friend Plegwin, he went white. He said the talk was from ‘drunk peasants’, that it was ‘abusive talk of the foolish’; but it was disconcerting to be denounced, and denounced for a detail. His offence was that when calculating the seven ages of the world, he implied that each age need not be exactly one thousand years, which was the usual version; he wrote of ‘the unstable ages of this world’. He was arguing with everybody else’s assumptions, which would later seem his great and even heroic virtue. Twenty years later, writing a new book, he was still furious. Christians and missionaries bought books, shared books, copied books. Having their doctrine on the page gave it a particular authority; they were, after all, the People of the Book. Since all information had to be shipped about, on the page or in someone’s head, it can seem that they must have carried reading and writing itself into the North, that we owe them literacy and not just in Latin. But the story is more complicated than that. The habit of writing and reading had reached Ireland before St Patrick came over on his mission; and what brought it was the trade that went back and forth across the sea. For Ireland wasn’t isolated before the missionaries arrived. Tacitus says the approaches to its ports were well known to traders in the first century ce. Words crossed from Latin into Irish even if Irish made them hard to pronounce; so the Latin purpura for fine cloth turned into corcur; the Irish long, a ship, is from the Latin for a longship, navis longa; and the Irish ingor comes from the Latin ancora, for an anchor. These are sea words, about sailing and about the goods that ships were carrying, and the words made the crossing before the fifth century. Military words also crossed, words the Christian missionaries did not need: words for a legion, a soldier, weapons and weekday names that are tributes to Roman gods such as Mercúir for Wednesday (and Mercury) and Saturn for Saturday. The Irish were outside the empire, so they did not have to play by Roman rules. They did not need reading and writing in order to rise in the imperial bureaucracy. They settled questions about who owned which piece of land by hearing witnesses and swearing oaths and paying attention to the memory of a community. When they first carved words onto stone, using the Irish ogam script, they were making simple memorials to the names of the dead, markers that were solid enough to stand as boundary markers and more reliable than memory. But the Irish were also trading with the Romans, and that required either memory or records that the Romans would understand; in their voyages to Gaul or to Wales, the Irish quickly learned that the Romans’ language was different, and was written a different way. At the same time they were working out their own way of writing down their Irish language. The ogam alphabet grew out of the marks made on wooden tally sticks to count sheep and cattle, but its other purpose may have been to mystify the Roman functionaries and merchants, who knew only their own letters. 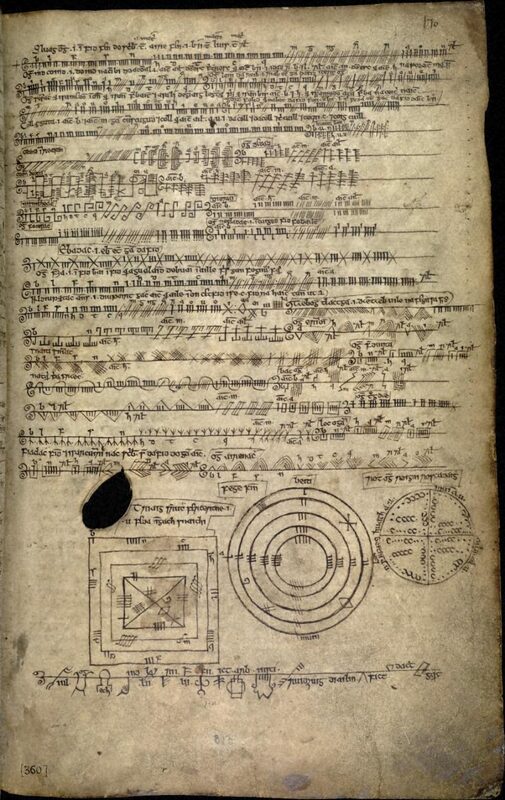 The Book of Ballymote (1390), explaining the ogam script. Via Wikimedia Commons. This meant that when Patrick arrived to convert Ireland in the fifth century, he had a head start. He was preaching the faith of the Book, carrying with him books of the law and the Gospels, and the Irish had their own habit of writing and reading already. They knew something about the technology. There are clues in the Irish law tracts written later, in the seventh century, which lay down that a contract can be proved by, among other things, ‘a godly old writing’, and witnesses can make a dead man’s agreement stand but only if they are not contradicted by relevant texts cut onto stones. Writing settles deep into Irish law. Much more remarkably, in his life of Patrick, the seventh-century monk Muirchú tells how the missionary found himself in a contest of magic with King Lóeguire’s druid. The king told the two to pitch their books into the water, and they’d see which god was worth adoring. The druid said he’d rather not because he knew about baptism and Patrick’s God was obviously a water god. It’s true that Muirchú was writing two hundred years later, and maybe he took for granted that the Irish had always had books because he had them himself, but the more likely story is literal: druids had some form of book, perhaps metal leaves, perhaps wood or stone, which could rival the Book. Patrick taught some men their alphabet to make them priests and bishops, but not all men needed the lessons. This fact that the Irish wrote down Irish very early still matters very much: it made books useful. Books could always be lovely things, used like jewels: sealed into shrines or put on an altar where nobody could possibly read them or sent to Rome as splendid presents for the Pope. Boniface wrote to the Abbess Eadburga on his mission to convert Frisia, asking her for a truly showy book, ‘a copy written in gold’ of the Epistles of Peter so as ‘to impress honour and reverence for the Sacred Scriptures visibly upon the carnally minded to whom I preach’. His other need, with age, was for clarity. He asked the Bishop of Winchester for a particular copy of the Prophets that he knew was written out clearly, because ‘with my fading sight, I cannot read well writing which is small and filled with abbreviations’. His books were written in an unbroken caterpillar of letters, nothing to separate the words, and they were meant to be read out loud, which required a reader who could make words and sense out of the string of letters on the page, and an audience used to hearing Latin. Many other peoples in Western Europe spoke a version of Latin, and they could understand the real old thing, but the Irish spoke a very different language; when a text was read out loud it was entirely different from daily talk and it gave them no clues to its meaning. They wanted words for the eye, not the ear. They wanted to see the form of the words clearly so they could translate their meaning, and therefore they began to put spaces between the words. Then they introduced their most brilliant invention: punctuation. Not only were the words distinct on the page: it was also clear where an idea stopped or paused or started. Silent, individual reading now became much easier. It had always been a way to meditate on the meaning of a book, and understand it better, right back to the fourth-century St Ambrose, who was notorious for reading silently even when he had visitors. Now the habit could spread. New monastic rules punished anyone who read aloud, but just under their breath so as not to seem old-fashioned; they spoiled the quiet reading for everyone else. Books for reading could be written out quickly and plainly: they were books for use. The Irish scribes trained Anglo-Saxon scribes. The first Christian missionaries to England had had to send for their books from Gaul or Rome, but in Bede’s time their libraries were being sent to Gaul to be copied. Bede, Boniface and the less famous Tatwine were all copied in northern France, in the monastery at Corbie. The most careful and solid text of Jerome’s Vulgate Bible was written out at Jarrow and Wearmouth and Lindisfarne, based on a manuscript from Naples; it rapidly became the standard version in all Northern Europe. By the seventh century there were already significant libraries in England. The Anglo-Saxons went out to found schools across the Germanic lands, and they became missionaries for words: the scholar Alcuin learned the new writing techniques in York and then took them over the sea to Charlemagne’s court in the 780s. He promoted a new idea: ‘the close study of letters’. A scribe at work in the Bodmer Codex. Via Wikimedia Commons. Anglo-Saxon scribes, too, were on the move, and not just with the various missions. They taught the court of Charlemagne the new idea of a library which should be well stocked with books and well organized for study. Charlemagne’s held historical books and ‘the doings of the ancients’, which were read aloud in the king’s presence, along with Charlemagne’s favourite, the works of St Augustine. When Alcuin was away from the court and wanted a copy of Pliny’s Historia naturalis, he asked to have it sent to him. On another occasion he wrote simply to ask someone to look something up in the bookchests of the court for him. This taste for books and the production of manuscripts caught on. Well into the ninth century, Anglo-Saxons were still crossing the sea to write in German monasteries, long after the first waves of missionary work. Some of the books they wrote were lovely and even spectacular, but most were portable information. With separate words and clear marks of where ideas began and ended, anyone could read in her own time for her own reasons. People wanted to read Bede. Anglo-Saxons overseas wanted his account of Saxon triumphs. The growth of the English Church inspired a wide audience as English missionaries worked to convert the Frisians and the Germans. By the ninth century, the books reached St Gallen on what is now the Swiss border, where the monk Walahfrid Strabo put together a collection of key quotes for teaching and included Bede. They were in Reichenau, the island monastery in Lake Constance, and the cathedral library at Würzburg in Bavaria. They turn up in central France as deep as Tours. Bede from the edge of the world was being published over the sea to the known world. Books [became] portable information. With separate words and clear marks of where ideas began and ended, anyone could read in her own time for her own reasons. It was a world of gifts, a routine of absolutely unavoidable exchanges: gifts up and down the social ladder, from kings to knights to keep them loyal, from knights to kings to keep them giving, from bishops to cardinals and from cardinals to priests; from Ireland to Northumbria to Frisia to Rome and beyond. Gifts bound people together in their proper ranks and obligations. Gifts were about power, and making it visible. When in Germany, the missionary Boniface sent silver to Rome and got back incense, and on one occasion a face towel and a bath towel; he sometimes sent unspectacular things like ‘four knives made by us in our fashion’ or ‘a bundle of reed pens’ because gifts were messages and statements much more than requests for something in return, and the act of giving was the whole point. At times his gifts were as diplomatic as state gifts to royalty today, but a bit more pointed. Boniface sent a hawk and two falcons to the King of Mercia to get him to listen to a message that he was not going to like at all, a dressing-down for his appalling sexual habits, especially in convents. Of all the gifts that he received, Boniface tells the Abbess Eadburga, he most appreciated ‘the solace of books and the comfort of the garments’. Giving and sharing books became a system for putting ideas out into the world. The glorious bible that Bede and others made at Jarrow was a gift for the Pope. Books were also buried with the saintly dead as gifts to keep them company. The book as gift, then, was sometimes quite different from the book to be read, a difference which later became almost ridiculous. One famous English calligrapher called Earnwine gave a fine book of psalms to King Canute and Queen Emma, who promptly sent it off to Cologne as a gift. When the Bishop of Worcester was in Cologne on the king’s business, he was naturally given a present, which happened to be Earnwine’s psalter. He brought it back to England, where it began. Nobody ever had to read a book like that. Books were also sent about so they could be copied and copied again; the text itself was the gift. Boniface, like Bede, wanted that kind of book. He sometimes knew exactly which one he was after, and at other times he fished about for titles. He asked a former student for ‘whatever you may find in your church library which you think would be useful to me and which I may not be aware of or may not have in written form’. 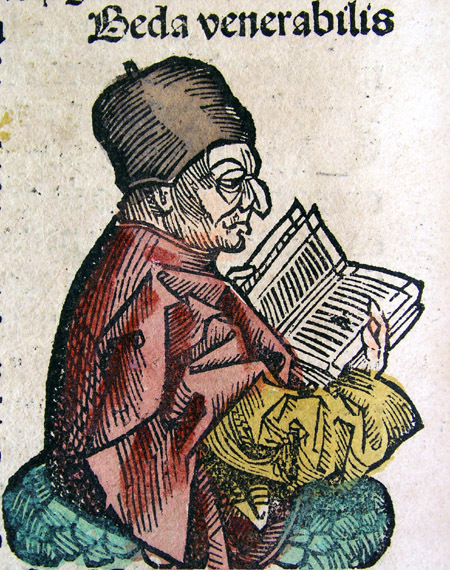 Just knowing which books existed and which you wanted was not at all easy; which is why Bede added a list of all his works at the end of the Historia ecclesiastica, including the biblical books he studied, the heroic verse he wrote, the terrible translation of a Greek text that he edited and corrected, his books on time and the nature of things, his hymns, his epigrams and his book on spelling. It reads a little like the back matter of a modern paperback. A librarian at Murbach in the ninth century was drawing up lists of books the monastery needed from the catalogues of other libraries and references in the manuscripts that he could examine; he was still using Bede’s list. He made notes alongside the names of some authors: ‘we are seeking his remaining books’ and ‘we want to find many others’. he’s not returning a book because ‘Bishop Gutbert has not yet returned it.’ Gutbert was Archbishop of Canterbury at the time. A young abbot can’t send back a book because, he says, the very important Abbot of Fulda wants time to make himself a copy. The books that circulated this way were not just books about the Bible and the Church. Later, holy libraries consisted mostly of the Church fathers, the founders of the story of the Church, although even then one monk wanted Suetonius and those good dirty stories about the Caesars. But in Bede’s time, and for centuries afterwards, monasteries and cathedrals also cared for the pagan leftovers of Rome. Long before the official Renaissance brought back classical culture and Latin texts, which would not have been possible if nobody had bothered to preserve them in the first place, the Irish were fussing with Virgil; when a seventh-century schoolmaster says he’s just had some valuable copies from ‘the Romans’ he might just possibly mean the ones in Rome, but more likely he means the Irish scholars influenced by Rome. In the mid eighth century a nun called Burginda made a copy of a commentary on the Song of Songs and added a careful, wordy letter to the ‘distinguished young man’ who received it; her Latin misfires a bit, and she makes a mess of the subjunctive, but she knows how to quote Virgil so she must have found Virgil in her convent library alongside assorted holy works. Ecburg, Abbess of Gloucester, used Virgil too in a letter to explain in proper, flowery terms her pain at being separate from her sister: ‘everywhere cruel sorrow, everywhere fear and all the images of death’, almost a direct quotation. And yet a pagan poet was a problem: essential, but dangerous. The scholar Alcuin read Virgil as a boy, imitated him in his own poems, but when he became an abbot he forbade his novices to read the man at all. In Carolingian schools Virgil might have been the very first heathen author the children read, mostly as an example of how to make verse scan, but he was firmly labelled heathen. Monasteries filed the heathen books among the schoolbooks and grammar because they were to be read in gobbets only, for their style and not their meaning, and under careful supervision. Nobody was supposed to pay attention to all the love, sensuality and battles. If you had the right connections, you could borrow books from these holy libraries. One affluent noble, Eccard of Macon, had to write into his will instructions to send back the books he had from the monastery at Fleury, a chestful of them that he obviously had never meant to return in a hurry. The cathedral librarian at Cologne wrote loans down carefully at the end of his book list, but he had to leave whole pages blank in case Ermbaldus, a most enthusiastic borrower, decided to borrow yet more books ‘for the exercise of his ministry’. To know laws and charters, to rule and know what you were ruling, it was very useful to read if not essential. Laymen owned books about law, about God, about farming and about war: the knowledge a noble needed. We know because they left them to their children in their wills, each title given to a particular child, so the books were something valued and considered. They often included history books, the history of the popes, the doings of the Franks. We can guess that the long poems in Latin and the historical stories at Charlemagne’s court were meant for a lay audience, and a rather grand lay audience at that. But the mighty were not exactly encouraged to take this literacy business too far. One eighth-century boy called Gerald was told to stop reading when he had worked through the Psalms and it was time for him to study more serious matters like archery, riding to hounds, and flying hawks and falcons. He did go back to books, but only because ‘For a long time he was so covered in small spots that it was thought he could not be cured. So his mother and father decided he should be put more closely to the study of letters.’ In Gerald’s case, remarkably, ‘even when he became strong, he continued to study’. Books could be heirlooms, and they could also be assets. In Bede’s time Benedict Biscop bought a lovely book of cosmographies while he was in Rome, an account of the whole known world. Back in England the very literate, even bibliophile, King Aldfrith offered to give the monastery land in return for the book, enough riverside land to support eight families. The deal meant books were a very important part of a monastery’s useful wealth. When the Emperor Charlemagne died, he left his library to be sold ‘for an appropriate price’ and the money given to the poor. He knew there would be a market. What’s more, books were stolen. The Baltic pirates who caught Anskar, ‘the Apostle of the North’, sailing to Sweden and made him walk the rest of the way were not at all averse to the forty books he was carrying with him. The Benedictine Loup de Ferrières in the ninth century worried about sending a work of Bede’s to an archbishop because the book was too big to hide on anyone’s person or even in a bag, and even if it could be hidden ‘one would have to fear an attack of robbers who would certainly be attracted by the beauty of the book’. More tellingly, a monastery in the Ardennes lost a psalter written in gold and decorated with pearls, which turned up intact and was bought in good faith by a pious woman; so it was the book that had value, not its incidental jewels. I urge you, William, my handsome, lovable son, amid the worldly preoccupations of your life, not to be slow in acquiring many books. Books took effort, time, skill. Books required dead calves, polished skins, the making of ink and colours and pens, the ruling of guidelines. They had to be written out by hand, carefully, and corrected and punctuated and decorated; they had to be sewn together so they would stay in their proper order. They required craft. They also required words, either a book to copy or else someone to invent and dictate. They mattered for their content, of course: Bede helped change people’s minds about the proper date of Easter, the way to date our lives in the history of the world, what happened in Britain when it became both Christian and Anglo-Saxon. But books also began to matter for themselves, even when they were practical books for reading and not jewelled, painted lovelies. Books were becoming independent of the way they were meant to be read. It came to this: books were worth burning. Gottschalk found this out. He was a monk, a poet, a bit of a wanderer who never wanted to settle in one house, and he had unconventional ideas: he was, roughly, a Calvinist seven hundred years before Calvin. He had come to think that all men were predestined either to Hell or to Heaven; that was God’s will, and no amount of good deeds or even bad ones could undo it. This was not the view of the Church, so he was ordered to appear, in 849, before the synod of the clergy in Quierzy, which is a town in Picardy, to answer for his opinions. He went along thinking he would be allowed to argue his case, so he carried with him the Bible texts he had used, and the writings of the Church fathers, the papers he needed to make his points: evidence, if you like. He expected discussion, but he was too optimistic. He found himself accused of heresy, flogged until he was on the point of death and told to keep silence for the rest of his life. Later, he’d be told he could be buried in holy ground only if he declared that he had changed his mind. He refused. The priests insisted on something else: they burned his books.They took Bible passages and Church fathers, books available in many places and entirely proper, and burned them publicly as though they could purge and cauterize all of Gottschalk’s thoughts about them in one fire. They were determined that nobody should read those books as Gottschalk read them, that his view of them and his opinions should be silenced as his mouth was: they were killing the ideas. The ashes from the fire are brutal proof that they now knew reading could change the use and meaning of a book. Nothing about a book was safe any more. From The Edge of the World, by Michael Pye, copyright © 2015. Published by Pegasus Books. Purchase the book.